Is Apple's default date and time display too big for you? Does it take up too much space on your screen? 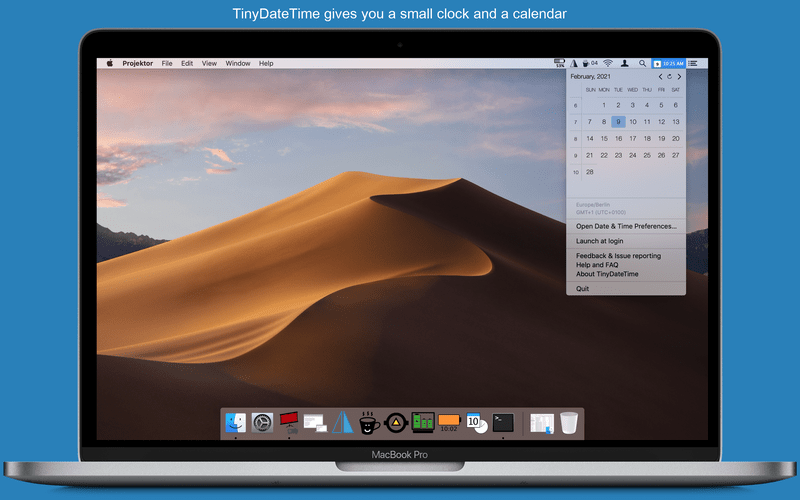 If you have always been dissatisfied with it, then you should now try TinyDateTime. The program informs you with a small icon about the day and time. The information is displayed extra in a small font to save you space in your menu bar. 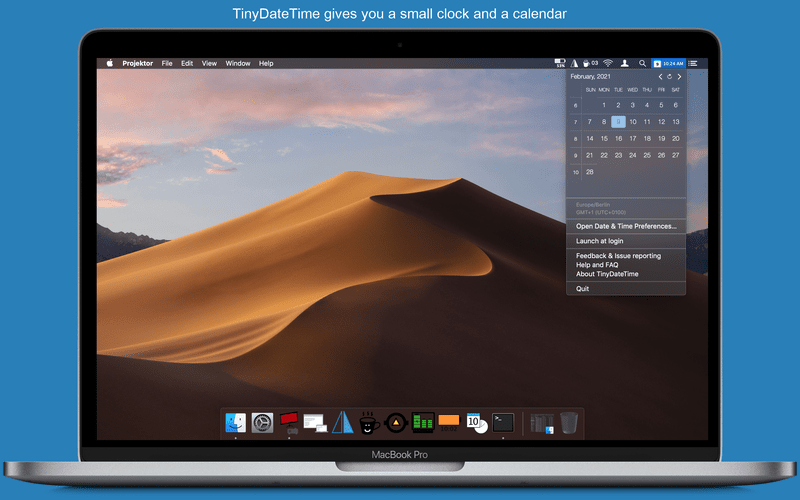 In addition, TinyDateTime provides quick access to a monthly calendar. The current day is marked in color for quick orientation. The time and date settings of the system can be conveniently accessed directly in TinyDateTime. [ADD] More localizations: French, Russian, Japanese, Chinese. [ADD] Translation for: german, spanish. [FIX] localized clock (24h vs am/pm format). Does TinyDateTime launch at login? Yes! You can enable TinyDateTime to launch at login by clicking on the status bar item and select "Launch at login". Can I switch to a different month in the calendar? Sure, just use the black triangles on the side of the month label to browse the next or previous months. Please ensure that TinyDateTime is installed under /Applications. Otherwise, the launch at login features does not work. Yes! There is a special trail version to help you decide whether TinyDateTime does what you need. Great, I'm always interested in feedback. In TinyDateTime use the Feedback / Issue reporting item in the menu or supply your request here. I try to get back to you as soon as possible.